Although Brooklyn and biking seem to go hand in hand, I never jumped on that band wagon. 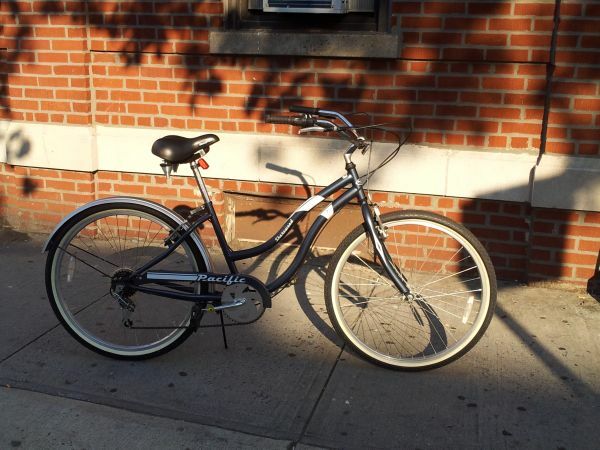 I rode a bike around my suburban neighborhood as a kid, I’ll ride when at the beach or doing a winery tour in Argentina (because that’s safe), but since I moved to Brooklyn 1.5 years ago I have never thought of getting a bike. Well, that’s a lie. I’ve thought about it, and then realized how scared and amateur I would feel. So, I’ve stuck to what I know well – public transportation and walking. Until this month. When my sister and I were in Portsmouth in the beginning of August our awesome hotel had bikes for guests to borrow. We took them around town, riding along the water, through the residential area, to breakfast, and on to a little island. It was a fast, fun way to explore the city, allowing us to discover things we probably would not have on foot. I thought, “Hey, how convenient would this be in Brooklyn.. riding to the store, the gym, friend’s places, the park, work.. so much faster than walking and so much nicer than the subway.” Since then I’ve been doing some research, ie asking all my biking friends what they think. My friends run the gamut – from casual Kmart to fancy $4,000 and everything in between. I realized there were a lot of important features I needed to know about – road bikes vs cruisers, gears vs no gears, the height, the fenders, the wheels, how old and heavy (I live on the 4th floor of a walk up) is it, does it need work done? On days I decide to ride to work, my commute will be cut by 15-20 minutes. Cars actually seem to be aware of bikers, even on streets with no bike lanes. Brooklyn is sure to be better about this than Manhattan, though. Or maybe I was in the way of traffic and they were being nice? I’ll have to figure that one out. Who has the right of way when you’re in the bike line and you’re going straight but traffic is making a turn in front of you? How closely do bikes have to follow traffic laws? Is it OK to go through a red light if there are no cars coming in the opposite direction? I don’t care how many vents your helmet claims to have to prevent you from getting hot, your head will still sweat. I will be slower than most bikers at first, although I was glad to see that all bikers go at different paces. Related to above, what’s the etiquette on bike passing? I dropped my bike off to get tuned up and realized I am going to miss it for the next few days. I see the start of a great relationship.